Protect your home, your family, or yourself with a portable mini spy camera designed for compact personal security. When you need to keep your home and family safe from potential thieves, burglars, or damage, you need a hidden surveillance camera that’s easy to use and captures video and photos in HD; and nothing works better than the SirGawain Mini Spy Camera. Designed to be small, compact, and discrete, you can easily monitor homes, bedrooms, a garage, a hotel room, an office, your kid’s nursery, or anywhere else you need protection. It’s also battery powered easy to set up, so you can use it as a body or sports cam, to record nannies, pets, children, or elderly and caregivers, and ensure you’re a step ahead of any dangers in your life. Get this fun, discrete mini spy cam for yourself, a friend, or a family member and let them capture hidden footage, protect their personal property, or just have a little fun making voyeuristic videos! Get the SirGawain G007 Security Mini Spy Camera today by clicking ‘Add to Cart’ above and always keep a watchful eye even if you aren’t around. 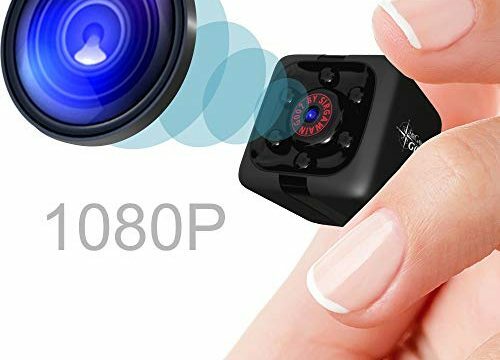 ★ Hidden Small Camera: This spy cam can be used for housekeepers or a nanny, baby, pet, personal security, professional surveillance, body safety or action and drone use. ★ HD Day & Night Vision: Our hidden mini camera boasts 1080p HD clarity, 12MP photos, 150° wide-angle lens, and night vision reaching 16′ with 6 invisible IR LEDs. ★ Motion Detection & Recording: Offering 60 minutes of battery run time our device can turn on and record when it senses movement or record 24/7 when it’s charging. ★ Easy to Use: Install a 32GB micro SD card (not included) in the hidden mini spy camera 1080p and let it loop record in a car, home, hotel, office, warehouse, or showroom. ★ [Unbeatable Quality]: Each camera is backed by superior craftsmanship, reliability, and 24/7 customer support with a trusted 30-day guarantee and 12-month warranty.